these pigments used this color wheel. 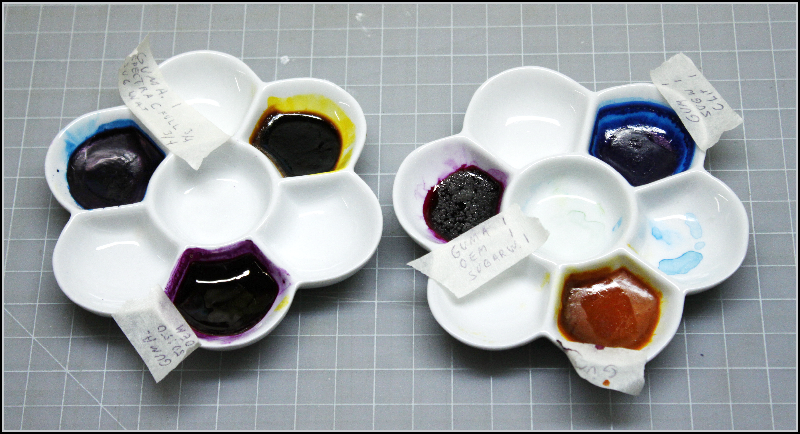 I'M MAKING A PRIMARY W/C PALETTE STARTING WITH A TRANSPARENT PERMANENT WATER COLOR PIGMENT AND A MEDIUM BASE MADE OF GUM AND HONEY. 10-9-10, 7 parts gum Arabic Daniel Smith or W/N solution, 14 parts alcohol (to disperse the pigment), 7 parts Spectra PR 122, 7 parts honey. The pigment I have is also wet with 7 parts water. That's 21 parts of liquid which takes awhile to dry. This formula was dry in 3 days, the volume was down 60%. It re-wets and paints well. I have to make two fillings of magenta in the well. I didn't have their dry pigment on hand. The porcelain palettes are really nice but they are heavier for traveling. Clean the brush before using any color off the palette. It's important to keep the primaries clean. Use a separate white dish or butcher's tray as the mixing palette. You see two different hues of yellow, yellow/orange side and yellow/brown side, both will dilute to a bright cadmium yellow hue. Notice the right-side palettes magenta pigment, sugar water causes pitting on the dried surface. Too much honey causes it to stay wet and sticky. * START MAKING MAGENTA AND OPERA WATERCOLOR. 8-15-13, I've been working on this for 3 days now. My magenta OEM magenta ink mix was the perfect color but as it ends up there are too many other chemicals in the ink and as a watercolor it ran while in the mail. OEM100:100GumAribic. It had been weeks drying but it never did. Now I'm going to use the Spectra PR122. The old best ratio was, 10 drops of alcohol, 10 Spectra PR122, 20 drops Gum, 4 drops of honey. (5 drops of honey never dried) I still have to make a big batch and test it. Ammonia dissolved the PR122 better, alcohol made clumps of color. At the same time I'm making Opera W/c. **Opera, the best ratio is: 1 Tsp dry Opera, 1/2 Tsp Gum, 1/4 Tsp Honey. Granules were appearing in the paint so I hand ground them finer in ammonia, That worked, I'm waiting for 2 days dry. * END MAKING MAGENTA AND OPERA. These three primary colors dry as fast as water, are transparent and not sticky to the touch. They re-wet and pick up full color load easily. The paint will dry matte on watercolor paper. The binder is gum arabic, made from the solidified sap of thorny, shrubby acacia trees, species Acacia arabica or Acacia senegal. Sap from the cherry tree was used first and popular in Cinnini's time. Gum arabic can be buffered with a carbohydrate plasticizer GLYCERIN $17.00= 16oz. This is the trihydroxy form of alcohol. This substance is necessary to retain water or act as a humectant for opaque colors. Other humidifiers are also carbohydrate moisteners, either a sugar syrup, corn syrup or honey. Honey is more effective than corn syrup at retaining water, glycerin has a drying problem. To make a Gum Arabic Solution from crystals. Place 1 part gum arabic powder or crystals. Heat 2 parts distilled water to a boil, remove from heat, and slowly pour over gum arabic, stirring to mix. Do not cook it. Cover it with cheesecloth and let it stand until tomorrow, stirring occasionally. Strain the solution through several layers of cheesecloth to remove impurities and sediment. Dextrin (STARCH, wheat or corn starch) can be used as a cheap extender to add bulk to opaque colors. China clay and calcium carbonate are also opaque extenders. I don't need a humectant for cyan. I use honey in yellow and magenta. Gum Arabic has high gloss, no stick, it is not a glue, pure it will not stick to a plastic well, shrinkage will break it's bond. Soap is a dispersant, it reduces paper gloss but does not make it matte, semi-gloss, allows pigment settling, soap reduces the glue factor. Sugar crystalizes and pits the cake's surface, a poor choice. Ethylene Glycol is matte even at 1%, dries pigment cakes quickly in PY100, I use it in my plotters ink using same transparent primary pigments. Ox gall, dispersant, cake is flat matte. Very powerful. Liquid soap works fine but I don't need either for the colors I'm making. Maybe just a touch to make them very compatible with each other. Buying the pigments wet saves adding a dispersant. If paint remains sticky or gummy after it dries on the glass it contains too much honey, humectant. Paint that shoots wildly wet in wet contains too much soap or sugar dispersant, honey is better all around and will do both. Transparent Clear Magenta, (15) Ammonia, (10) Spectra PR:122, (20) Gum, (4) Honey. FINAL FULL PALETTE Well #1 = (4) wet, Spectra Tartrazine Yellow PY100, (4) Honey, (15) gum Arabic, this can be lightened to the Cadmium Yellow Med with more Gum Arabic. Well #2 = Tube colors, yellow oxide and Burnt Sienna. Well #3 = Magenta, (OEM_ink1:1Gum) I changed my transparent magenta because the OEM magenta takes too long to dry in the well. Now I use Spectra Colors Corp. Magenta. 15 parts ammonia added to the wet pigment, this dissolves the magenta pigment completely, 20 gum Arabic, 10 pigment, 4 honey. Well# 4 = 3 tube colors to speed-up mixing the colors: 1. ShinHan Opera magenta makes the an excellent red or blue. 2. ShinHan Bright Rose (a very good warmer magenta between PR122 and PV19). 3. Thalo green Y/s. as the opposite of magenta for neutral darks with only two colors..
Well# 6 = Ultramarine Blue, Cobalt Blue, Burnt Umber, the yellow/blue opposition. For making neutral darks with two colors. ShinHan Opera in the tube cannot replace pure PR122, it won't make the darker values. Opera, with PR122+RV10 will make even brighter reds and blues but it fades a little after 6 months in sunlight but not as much as alizarin crimson, which was the magenta before losing a major battle in the PAINT WARS to quinacridone. Now quinacridone has this new compound color. Holbine makes a cheaper slightly larger particle sized Opera pigment. Good though. I made an Opera acrylic that works great. I disolved the pigment in ammonia first, before adding the acrylic heavy gel. I'm working on Opera water color now, 3-25-13, but it's very difficult.The best so far has been 1 drop of honey, 1/2 teaspoon of Ammonia, 1/2 teaspoon of Gum and 1/4 teaspoon of dry Opera pigment. The tests are far from over. 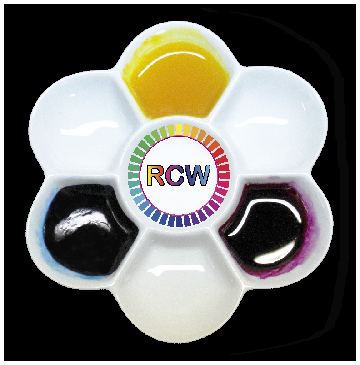 with 3 RCW permanent transparent primary water colors $35. These are the same pigments I use in my giclee printer/plotter to print the Real Color Wheel. I made a new plastic palette, the top 3 wells are: #1, a brown tartrazine mixture, #2 a medium red-brown and a light yellow. SEE THE NEW TESTS AND PALETTS HERE.